Zev Rose is the senior shareholder and President of Sherman Silverstein and ex-officio member of the Firm's Management Committee. Mr. Rose is a preeminent attorney, advisor, and community leader. 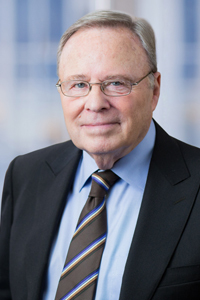 As attorney, Mr. Rose has practiced real estate law for more than 50 years. He has represented major clients in the acquisition, financing, development, management, and sale of shopping centers, apartment complexes, office buildings, and residential projects throughout the eastern seaboard. He also has consummate expertise in corporate, partnership, business and financing law and transactions. Before entering private law practice, Mr. Rose was Law Secretary to the Honorable Mitchell H. Cohen, US District Court, District of New Jersey, and later served as Assistant Camden City Solicitor, Camden City Prosecutor and Assistant Camden County Counsel. Mr. Rose is a past member of the Board of Directors of Susquehanna Bancshares, Inc., Susquehanna Bank, Valley Forge Asset Management, Stratton Management Company, Sempter Trust Company and Boston Service Company, Inc. d/b/a Hann Financial Service Corp.
Mr, Rose is also Solicitor for the Jewish Federation of Southern New Jersey and its Agencies, Jewish Community Center, Jewish Community Relations Council, Jewish Family and Children's Services, Jewish Senior Housing and Healthcare Service and Jewish Federation Publications.